One of the largest spas on the island of Bali, Prana, unlike any other, has been designed with a strong influence of Indian & Middle Eastern exotique architecture. Enjoy the rituals of ancient kings and queens as you journey through Prana’s sacred Eastern traditions of health and beauty. A decor inspired by the legendary Moguls of Rajistan ushers you into a world of divine opulence. As you enter our lofty courtyard, the full meaning of Prana will be revealed to those in search of something different and profound. A relaxed yet strangely exotic atmosphere is before you. Prana Spa itself is a bewildering riot of colours combined into the traditional decor of Islamic arches and corridors; an amazing fantasy world to fulfil your dreams of exotic pampering by our skilled Balinese therapists. 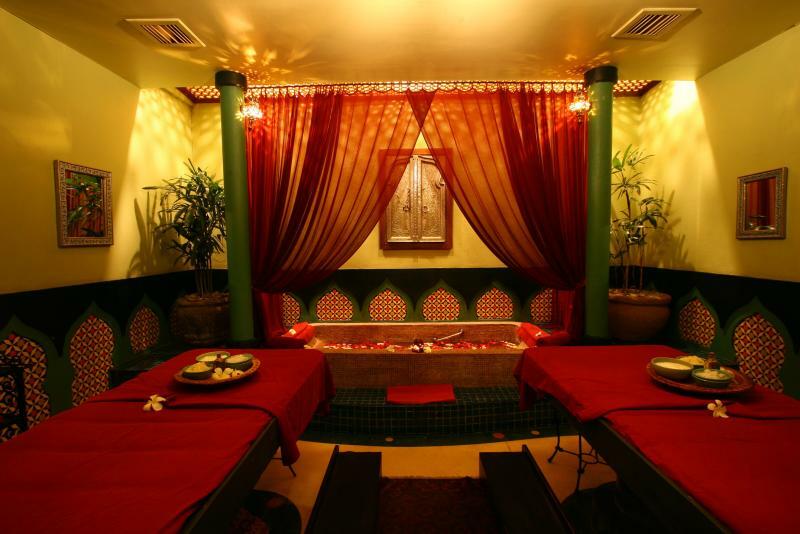 With a luxurious decor inspired by the Palaces of Rajasthan, India, Prana Spa provides authentic Ayur-Vedic, Indonesian Jamu, and conventional beauty treatments, using the finest-quality, natural products and offered with the highest standards of comfort and hygiene. It is truly one of the unique spas of the world, in which hand-picked furnishings, including beautiful carpets, mosaics, carved wooden doors and Indian silk paintings replicate the intricate details and facets of a 16th century Rajas palace. The Sanskrit word Prana refers to the vital force of life, and everything about Prana Spa has been designed to provide guests with a gentle, restorative experience, tailor-made to their individual requirements and needs. The spa therapists are trained to international standards, and on-going training ensures that guests enjoy standards of professionalism found only at a handful of top spas in Asia. As one enters Prana, one is immediately surrounded by restorative sounds and scents within an energizing environment of vibrant designs and colours, which will inspire a new strength within those who experience them. It is a virtual universe of visual delights, where the guest can take refuge from the cares and worries of modern life. The spacious 1,300 square metre Spa provides a comprehensive range of facilities: 24 massage rooms (single and double), hot and cold plunge pools, 4 rain shower massage rooms, 2 saunas and 3 steam rooms, as well as separate areas for reflexology and beauty treatments. After your treatment, relax with a cup of herbal tea in the lush, central courtyard garden filled with palms and bougainvilleas, or dine at the Prana Restaurant which offers organic Ayur-Vedic and Indian food options. Afterwards, browse Prana is exclusive boutique with its collection of fine artworks from around Asia. Open : 10.00 am until 09.00 pm every day. Enjoy all that the “Island of The Gods” has to offer in Prana’s most popular package – The Mystique of Bali. Succumb to the traditional techniques of a Balinese oil massage followed by your skin being polished by the herbal, aromatic spices of the lulur body scrub. Next a cooling yogurt splash will condition and balance your skin. Soak in a floral fantasy as you relax in a Rose petal and Frangipani flower bath with a refreshing beverage. Offering the ultimate in weight loss management, this 120 minute treatment allows you to experience the latest in cellulite and water retention reduction. Prepare yourself for ultimate decadence as this exhilarating process commences with a full-body coffee exfoliating scrub. As the awakening aroma and rhythmic sensation stimulates your senses, toxins are dispelled from the blood, eliminating impurities through the pores of the skin. As you rest on your back, the tepid water leaves you clean and refreshed and prepares you for the next delightful phase, a seaweed mask. The smooth, rich seaweed is applied on the thighs and the torso, areas of the body that need special attention, and then you are prepared for a 15-minute steam session. As the uplifting steam firms your tissues and eliminates bloating and retention, the fresh taste of chilled water and the therapeutic scent of eucalyptus uplift the senses. After a refreshing shower, prepare for a deeply therapeutic massage as France’s most dynamic weight loss creams and oils are applied throughout the session. It’s all in the name! Simply put, you will be pampered from head to toe during this blissful treatment. Enjoy a relaxing full body massage using the best in our custom blended aromatherapy oils. The focus now turns towards the heavens as you experience mental relaxation and serenity during Prana’s famous Shiro dara. Your therapist will massage vital marma points as a golden stream of medicated oils cascades off your forehead. This is a deeply meditative and transformative experience and we recommend you relax after your treatment. Sun and Moon treatment begins with your choice of exfoliating body scrubs, followed by a body polish using fresh ingredients to condition your skin. A short visit to our steam room will give your complexion a healthy glow by flushing out toxins held just below the surface of your skin. Let stress and tension melt away with a flowing massage, using our own special blend of aromatherapy massage oils continue with a foot massage. Finally a relaxing facial to cleanse, exfoliate and leaving your skin clean, balance and hydrated. Shiro dara literally meaning “head flow” is one of the most desired Ayurvedic treatments. Beginning with a head, scalp, neck and shoulder massage, you will begin to calm the wandering mind. Meditative bliss will occur as a slow pouring of medicinal oils cascade over your sixth chakra, stimulating your third eye and window to thesoul. Recommended for headaches and insomnia, find out why this is one of the most profound and popular treatments offered. Your treatment begins with our Prana Foot Ritual – a time honored welcome for the weary traveler. Your feet and lower legs will be cleansed with rose petal and peppermint water, and then scrubbed with sea salt. A combination of Swedish and Balinese massage techniques, palm pressure and long strokes reduce muscle tension. Stretching and pressure point techniques originating from ancient times balance the flow of “chi” through energy channels in the body known in Thailand as sen lines. This is a non oil massage – Thai style pyjamas are provided. Spa Treatments Special Offers : 10% Discount on rates below ! Prana’s Jet Lag Remedy is the perfect treatment to diminish the effects of jet lag - It is recommended both before and after you travel. The treatment begins with a peppermint infused foot bath, followed by a firm back, neck and shoulder massage, which will relax tense and knotted tissue as well as improving the circulation. Continue with a refreshing facial to recondition and moisturise the skin, finally relax and enjoy our 60 minute foot massage with a hot towel compress. A massage is a wonderful way to relax, increase your energy and relieve discomfort during your pregnancy. Prana’s pregnancy massage is a gentle, non-invasive, full-body treatment, achieved by using a side-lying position comfortably supported with cushions. The technique used not only concentrates on alleviating some of the aches and pains associated with pregnancy but also increases circulation and reduces swelling. After the massage, retreat to the salon and enjoy our 60 minute hair cream bath and scalp treatment and a freshly made herbal tea. Designed exclusively for men to enhance wellness and achieve optimum health. Relax and enjoy an invigorating, firm massage improving blood circulation, breaking down adhesions and ultimately easing stress. Followed by a relaxing facial to cleanse and exfoliate; leaving your skin clean, balance and hydrated. A fantastic 120 minute treatment to balance the body, mind and spirit. Beginning with the steam room and contining with a body scrub and a face peel to deeply purify your skin, followed by invigorating rain shower massage. This Purification Ritual finishes with a wonderful signature massage. 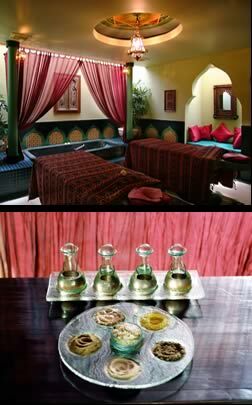 Enjoy the authentic tradition of the Middle East. Beginning with a session in the hot and cold plunge pools followed by steam room, relax in Prana’s palace courtyard. Next your body will be exfoliated and cleansed under the tranquil rain shower. To complete this trio, retreat to the salon to enjoy a scalp treatment and nourishing hair cream bath while sipping on a refreshing beverage and enjoying Turkish delight. Massage is a wonderful way to relax, increase your energy and relieve discomfort during your pregnancy. Prana’s pregnancy massage is a gentle, non-invasive, full-body treatment, achieved by using a side-lying position comfortably supported with cushions. The technique used not only concentrates on alleviating some of the aches and pains associated with pregnancy but also increases circulation and reduces swelling. This treatment was originally developed by American Indians to dissolve tension, melt deep seated tautness and leave one with a profound sense of relaxation. Under the skillful and simultaneous hands of therapist, your body will be massaged with heated basalt stone. A unique treatment that blends a European style massage with anti-aging techniques and natural ingredients. Cleansing begins with a skin firming massage followed by a gentle exfoliation and steam. Your therapist will then use a massage technique to firm and lift the skin, focusing on areas where the skin tends to reveal signs of aging. A hydrating mask of sandalwood is then applied to the skin leaving you looking and feeling rejuvenated and refreshed. Prana Signature Facial includes a hand and arm massage allowing you to completely relax. Prana’s Male Facial is a unique treatment that blends European style massage with anti-aging techniques and natural ingredients. Enjoy our natural chemical free facial design for the male skin. This treat will cleanse, exfoliate and hydrate your skin leaving it radiant and clean. We recommend you shave a few hours prior to having this treatment. Our product line consists of 100% natural botanical and organic ingredients. Allow your body, mind and soul to unite in a perfect balance. Awaken the soul with an exfoliating body scrub under the cleansing waters of rain shower. Revitalise your body as you are massaged and calm your wandering mind as you experience a Natural Facial. Relish in the whole of body, mind and soul. Best Hotel Rates in Bali !! Bali online tour bookings ! The free Job Board for Indonesia!